Ask Jeff Dobie what Northern Illinois University means to his business, and the pub owner doesn’t hesitate with his answer. Jeff Dobie, owner of Fatty’s Pub and Grille. 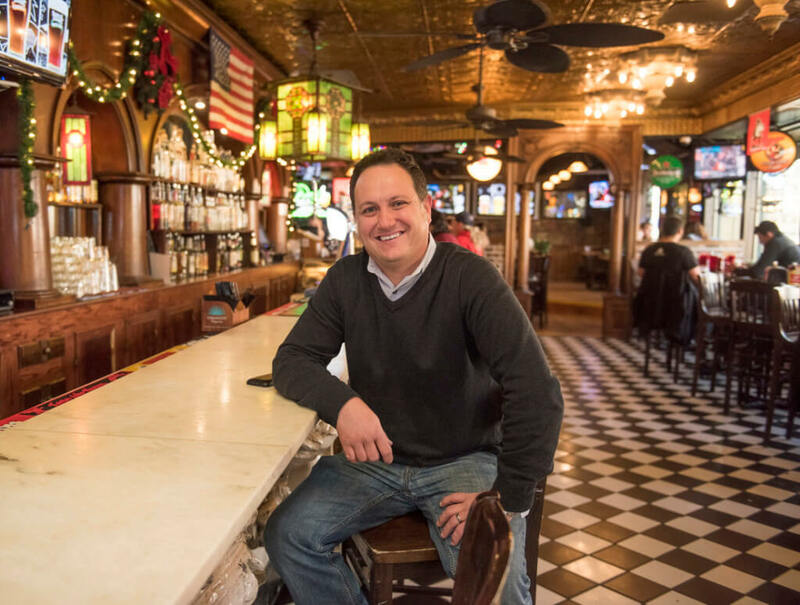 “It would be hard to support a business of our size if not for the university,” says Dobie, owner of Fatty’s Pub and Grille, located just a stone’s throw from Huskie Stadium and the NIU Convocation Center, a 10,000-seat venue for university sports and entertainment. When the NIU academic semester is in full swing, along with Huskie sporting events, Fatty’s employs as many as 70 workers, including about a dozen full-timers. At a cost of more than $500,000, the restaurant just completed significant additions that include expansion of its beer garden, a banquet room for catering, a catering kitchen and a new basement for storage. 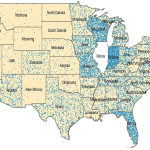 A new economic analysis points to the significance of NIU as an economic driver—not only in DeKalb but across the northern Illinois region. The analysis places a “conservative estimate” of NIU’s economic impact at $900 million a year. Nearly 12,900 jobs, with a total payroll of $423 million, directly or indirectly depended on the university in fiscal year 2014-15. Richard says the estimate of NIU’s total economic contributions to the region is conservative because it doesn’t include spending by university visitors, another component commonly used in economic impact studies. Richard says that data was unavailable but likely would have pushed the university’s total annual impact into the $1 billion range. The study examined the economic impact generated by NIU’s main campus in DeKalb, as well as its regional sites in Rockford, Hoffman Estates, Naperville and Oregon. 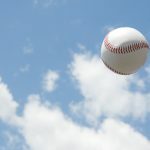 The impact region includes Boone, Carroll, Cook, DeKalb, DuPage, Jo Daviess, Kane, Kendall, Lake, LaSalle, Lee, McHenry, Ogle, Stephenson, Whiteside, Will and Winnebago counties. 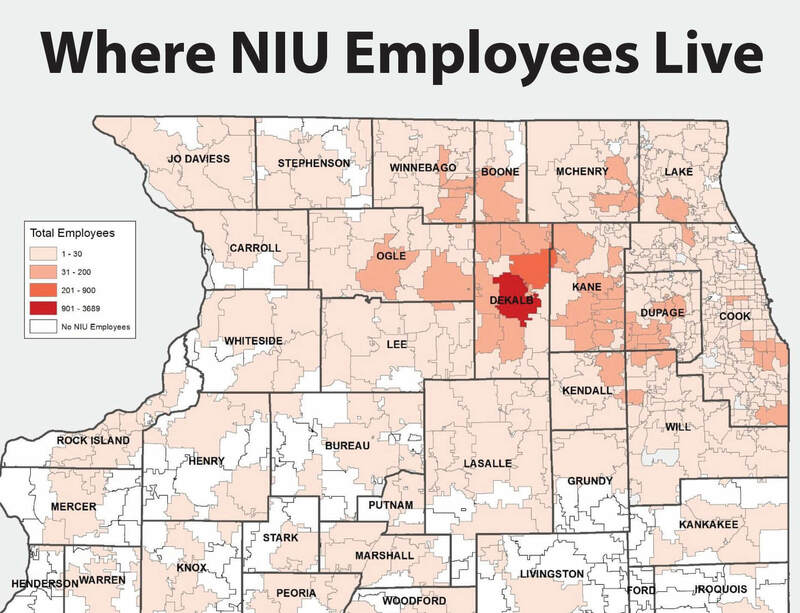 More than 97 percent of NIU employees live in this region, with the majority residing within a 30-mile radius of the main campus in DeKalb. During the 2014-15 fiscal year, NIU employed 3,671 full- and part-time employees and 5,423 student workers and graduate assistants. 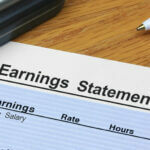 These 9,094 workers earned a total of about $241 million. To put those employment numbers into perspective, Richard notes that there are about 4,000 people employed in all manufacturing businesses in DeKalb County. 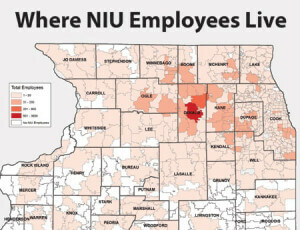 The economic impact analysis takes into account the fact that operational expenditures ripple through the economy as NIU employees spend their earnings and as companies that do business with NIU pay their employees, who in turn contribute to the local economy. With many companies large and small conducting business with the university, its economic footprint extends near and far. Over the past six years, Kelmscott Communications, an 80-year-old marketing firm based in Aurora, has provided large-format signage to NIU. 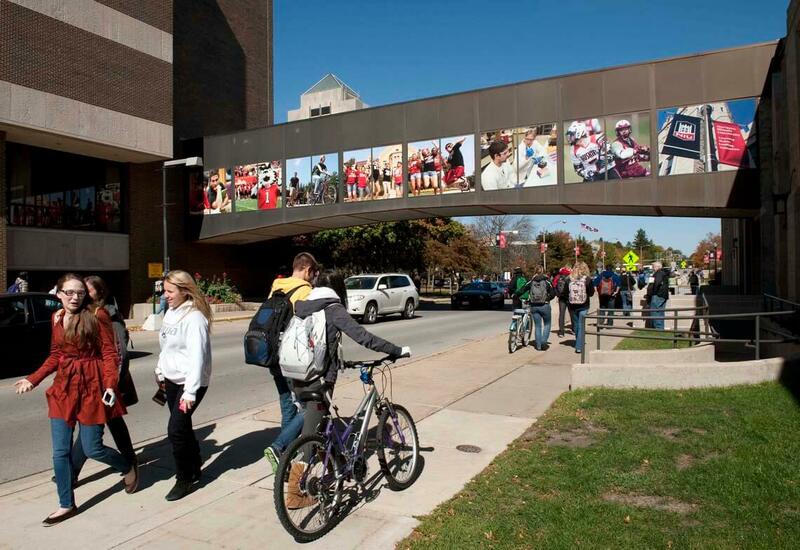 The company’s work includes the highly visible graphic designs on Huskie Stadium and the photographic mural over Normal Road in the heart of campus. Gabi Rubeck is a field account executive with CDW-G, a leading information technology provider to government and education headquartered 60 miles from DeKalb in north-suburban Vernon Hills. “Northern Illinois University is a significant partner to CDW-G, having forged a meaningful relationship over the past several years,” Rubeck says. The signage work of Kelmscott Communications includes the mural over Normal Road. “Our organizations are able to support one another not only as fellow northern Illinois organizations, but also through a business partnership that allows our collective teams to align resources and strengths to bring a positive impact to the university and its community,” she says. In calculating NIU’s economic impact, the new report focused on NIU’s 2014-15 operations (employment, payroll and purchasing), capital expenditures (renovations and new construction) and student spending on goods and services. NIU operations contributed more than $605 million in output to the regional economy. Output measures the total value of goods and services produced by private companies and governments. University-related purchases amounted to $108 million. This included expenditures on utilities, furniture, scientific equipment and food for resale in dining halls. Purchases by the university and spending by its employees indirectly created nearly 1,700 jobs. NIU spent $34.5 million on capital projects, which directly generated an estimated 139 construction jobs. NIU students spent an estimated $129 million in off-campus housing, food, transportation, entertainment and other goods and services, supporting nearly 1,800 jobs in the region. Even more important, though not measured in this report, is the impact of NIU on the future, President Baker adds. “By partnering with local government and businesses and enhancing quality of life through cultural and social events, major research universities such as NIU not only boost economic activity but also build community,” Baker says.